It took a long delay for the genre to take hold after The Blair Witch Project, but the “found footage” horror film has become the dominant form of the past five or six years—and, accordingly, the one greeted with the loudest groans as its clichés have festered. [REC] and Quarantine ([REC]’s Hollywood carbon copy), Cloverfield, the Paranormal Activity movies, The Last Exorcism, Apollo 18, The Devil Inside, V/H/S, The Bay: That’s long list for a few years, and together they mark a fascinating time for horror, when the cheapness and compactness of shooting on digital corresponded with the ease of YouTube-ready self-documentation. Technology has become both a tool and a terror, something that’s made filming (unbounded, on multiple cameras, with few limitations on movement) simple and cheap while opening up the possibility of new ghosts in the machine, as standard horror threats (monsters, zombies, the demonically possessed) get up close and personal. Heretical confession: I like the “found footage” genre, with the caveat that its shelf life will be perhaps more limited than similar phenomena like the slasher movement. While their stylistic rigidity and convoluted mythology have weakened them over time, the Paranormal Activity movies have served as an annual reminder of the horror fundamentals: The simple tricks of light and shadow, of off-screen space, of thumps and bumps, and of anything else that limits the audience’s view to whatever they conjure in the dark corners of their imagination. (If there’s been a single more chilling effect recently than the oscillating-fan cam in Paranormal Activity 3, I can’t think of it.) There are other benefits, too, in the offhand way a handheld camera can reveal big pieces of information—think about the first view of the monster in Cloverfield, for example—or the invention required to turn the limitations of camera position (on the shoulder, surveillance, Skype, etc.) into an asset. In many cases, the common drawbacks of mundane, semi-improvised first acts and abrupt, drop-the-camera endings have generally been worth the tradeoff. Since the mini-boomlet of “found footage” films began, none have been as scary and smart as Jaume Balagueró and Paco Plaza’s [REC], which has the added benefit of confining most of the action to a creepy, three-story apartment building sealed off in quarantine. The series has, naturally, been run into the ground—Balagueró stuck around for the more-of-the-same-but-more first sequel before moving on to the well-received Sleep Tight—but the original film skillfully exploits the tension of a single-setting horror-thriller while amping up the scares at an agonizingly steady pace. It’s hard to know when, exactly, [REC] shifts from a zombified twist on viral thrillers like Outbreak to a bloody assault on the senses, but Balagueró and Plaza are admirably deliberate in making the transition. They play the long game, sacrificing the standard jump scares at 10 or 15-minute intervals as part of a strategy to shock viewers into a collapsed lung in the final stretch. It doesn’t seem all that scary until little seems scarier. [REC] opens with the usual screwing around before anything happens, though it’s more engaging than most “found footage” films on this front, thanks mainly to Manuela Velasco’s lively performance as Ángela, a reporter for a lighter-side-of-the-news TV series called While You’re Asleep. (“Who’s awake to watch it?” goes the obvious question.) “I’d love for the alarm to ring,” says Angela during this fateful visit to a fire station, a friendly reminder to be careful what you wish for. 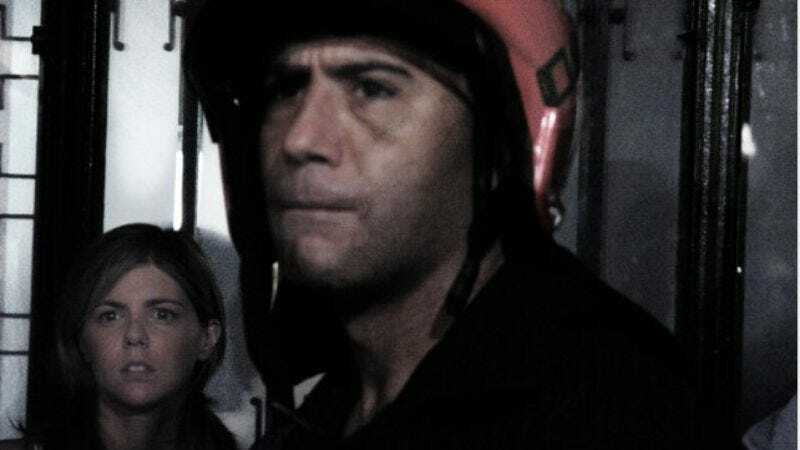 She and her never-seen cameraman Pablo are given a tour of the place and allowed to embed with two firefighters, but they’re treated to a dull night until a call comes in about an elderly woman in distress. Escorted upstairs by a police officer, the firemen and the film crew witness a dead-eyed woman in a blood-soaked nightie take a chunk from the officer’s neck. That brief, startling shot of a fireman smacking the ground after falling from an upper floor speaks to the strengths of the “found footage” style. While it’s true that there’s nothing stopping a conventional horror film from staging a death in this way, the first-person camera of [REC] requires an entirely different mindset. For one, the omniscient camera of a conventional horror film might be expected to let the audience know where the fireman has gone and what kind of trouble he’s gotten himself into, but here, Pablo has joined the throngs of tenants at the bottom of the stairs, trying to get out of the building. So naturally, he can only experience this terrible death with the surprise of everyone else on the ground (and in the audience), as a bolt from the blue—no anticipatory music, no pause in the frantic screaming match between tenants and the authorities, just a faint thump from above and a smack down below. The overall effect of [REC], owed to the twin confinements of the apartment building and the single camera, is of narrowing options and narrowing space, starting from the massive garage and dining hall at the fire station and ending with Ángela and Pablo penned into the penthouse apartment, with zombies pounding on the door and an enveloping darkness that’s beaten back only by the camera light. Watching them squirm futilely in the dark, with no exit, has a suffocating, visceral intensity, the cinematic equivalent to being buried alive. They try to keep on taping, but in “found footage” horror films like [REC], the camera is the Final Girl.